On this page you will learn how Replenishment Alerts can help you manage your inventory without having to constantly monitor each listing. Replenishment Alerts enable you to manage your inventory in Amazon's fulfillment centers without needing to constantly monitor each listing. You can set the alert quantity for individual products or groups of products. When the listing's fulfillable quantity reaches your threshold, either in units or weeks-of-cover (the number of weeks of on-hand fulfillable inventory based on your sales over the last 30 days), we notify you by sending you a Replenishment Alert e-mail. When you select an alert quantity for a given product, select a quantity based on your average sales and the time it takes to order and ship stock to a fulfillment center. For example, if it takes you two weeks to order and ship a product, and you sell about 100 units of that product in a week, it would be advisable to set the alert quantity to at least 300 units. When your fulfillable inventory for that product reaches 300 units in our fulfillment centers, we will notify you. This will give you three weeks to place an order with your vendors and send in a shipment to our fulfillment center before your inventory is depleted. Alternately, when you a select a weeks-of-cover threshold, you should select the number of weeks that it takes you to order and ship stock for that product to Amazon fulfillment centers. Click the Inventory tab at the top of the Seller Central page, then click on Manage FBA Inventory. On the Amazon-Fulfilled Inventory page, check the listings for which you want to set Replenishment Alerts for. From the Apply to Selected Item(s) pull-down menu, select Set Replenishment Alerts and click Go. 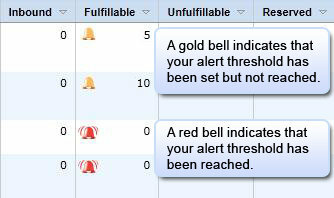 On the Set Inventory Replenishment Alerts page, enter the threshold in the Alert Threshold field. You can set each product's threshold separately, choosing either when Weeks-of-Cover reaches (weeks) or when fulfillable quantity reaches (units) and inputting a numeric value in the cell. You can identify listings with Replenishment Alerts from the Inventory Amazon Fulfills page. A gold bell will appear in the Fulfillable column next to the quantity. If the inventory has reached the replenishment alert quantity, the bell will turn red.